Devlyn slammed his door. “If we wait much longer, she’ll have changed and be half frozen in this weather.” He’d rescue her again. He had to. Not for Volan, but for his own greedy desires. But what to do with her after­wards? He knew what he wanted to do with her. Make her his…forever…his mate for life. Wrinkling her nose, she bared her not-very-scary human teeth. Anything to show him she wasn’t intimi­dated by his posturing. After what seemed like an eternity of an old west­ern gunfight showdown, he turned, and trotted out of the den. She took a deep breath, then quickly followed him out. The icy drizzle coated her skin. Hoping to make her escape easily, she crossed the pen to the keeper’s door. What she wouldn’t have given for her wolf’s thick undercoat—the dense second coat of fur virtually water­proof, a thermal insulator so effective even snow falling on her back wouldn’t melt. Whether the wall rose eight feet or ten…didn’t matter. She didn’t see any way to climb the rough con­crete without foot or hand holds. She turned back to the other side. Her heart fell. She wouldn’t be able to climb out that way, either. 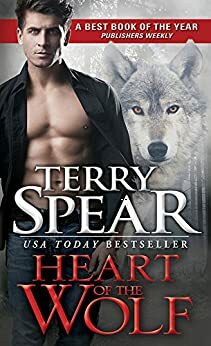 USA Today bestselling author Terry Spear has written over sixty paranormal and medieval Highland historical romances. In 2008, Heart of the Wolf was named a Publishers Weekly Best Book of the Year. A retired officer of the U.S. Army Reserves, Terry also creates award-winning teddy bears that have found homes all over the world and is raising two Havanese puppies. She lives in Spring, Texas. Posted on 22/12/2017, in Authors & Books, Blurb, Buy Links, Excerpt, Giveaway, Promo, Spotlight / Blog Tour, Teaser and tagged @SourcebooksCasa, @TerrySpear. Bookmark the permalink. Leave a comment.